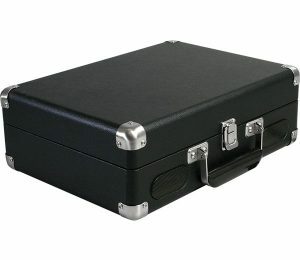 The Vinyl Styl™ Groove portable black suitcase turntable is one of our best sellers. The color black can express a mood (play your Goth records loud!) or it can serve as a practical and simple solution when trying to find the perfect turntable for any place you call home (the color black matches everything!). However, the moment you lift the lid and put on a record, the music will provide all the color you’ll ever need. The Vinyl Styl™ Groove portable 3-speed belt driven suitcase turntable is the perfect way to enjoy your favorite vinyl records, whether this is your first record player or you are rekindling the passion for analog, the Vinyl Styl™ Groove turntable is sure to provide hours of listening pleasure. 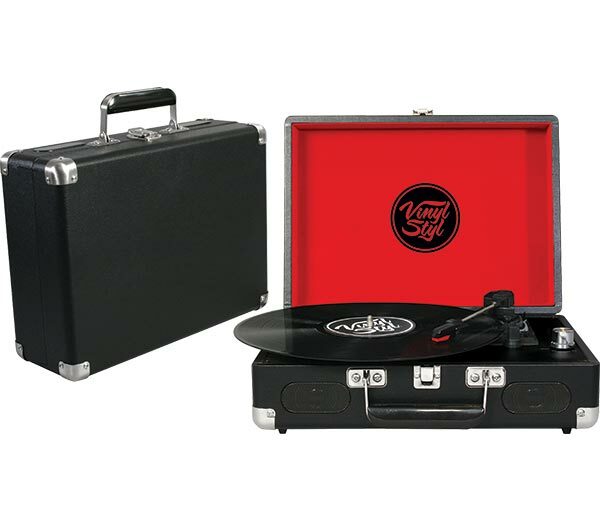 In a variety of custom designs, the Vinyl Styl™ Groove portable turntable comes equipped with two full range stereo speakers, stylus with protective cover, 3.5mm headphone output jack, RCA outputs and a belt driven platter allowing you to choose from 3 speeds; 33 1/3, 45 & 78 RPM. Gather up the latest releases or go out and dig for some vintage vinyl, either way the Vinyl Styl™ Groove turntable will be a trusted companion on your analog adventures.